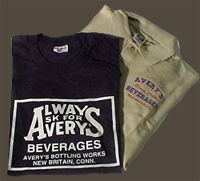 Show your love of Avery's with these great items. Call us at 860-224-0830 or come in to browse! Screen printed on front and back. Various colors, adult S, M, L, XL, XXL. 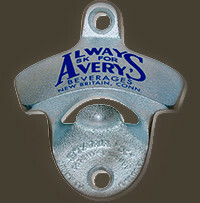 Avery’s Starr X wall mount bottle opener. 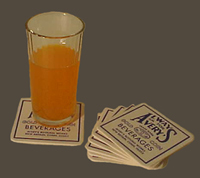 Pair your favorite Avery's Soda with our branded Avery's Soda coasters! The perfect gift for any family member or friend, these coasters are high-quality and sport our classic "Always Ask for Avery's" logo. Avery's Coasters, pack of 8. 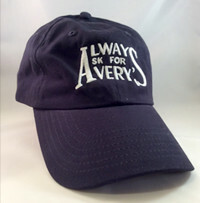 High quality cotton cap embroidered with "Always Ask for Avery's" logo on the front, and on the back it reads, "Avery’s Bottling Works. New Britain, CT". Old Fashion Embossed Tin Sign.